Discussion in 'vBench (Works in Progress)' started by KenBoyle, Mar 1, 2018. Finally back to painting after several months off. 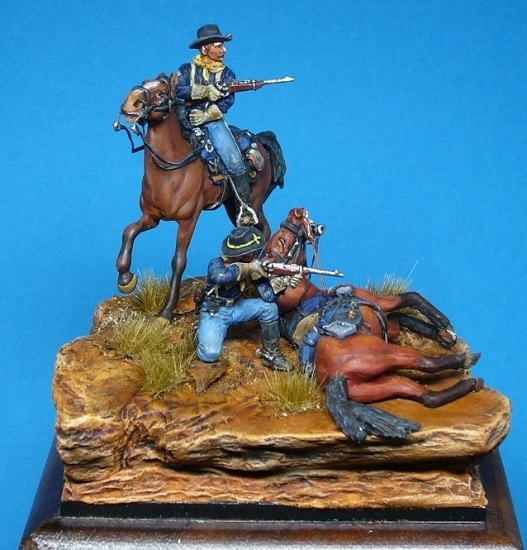 This is Oniria's newest release from their U.S. Cavalry in the Plains series titled "Apache Pass". 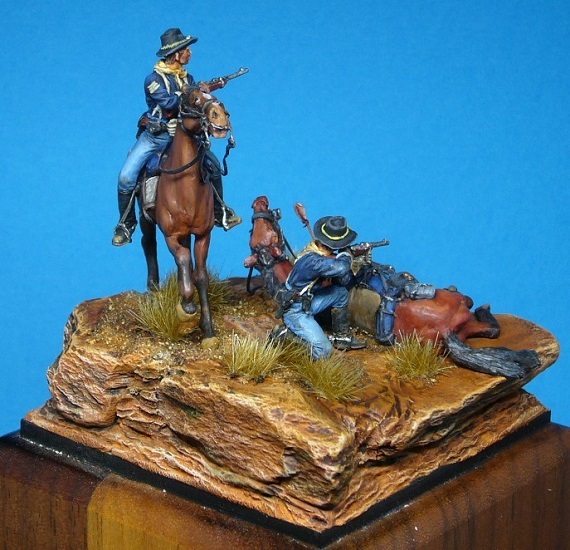 It is a 28mm vignette reminiscent of Western movies of the 50's and 60's. It's a great kit with lots of detail and I enjoyed painting it. It brings back a lot of memories of days gone by. As with other Oniria Kits, I added my own Bridle bits made of thin wire. The reins are made from lead foil included with the kit. Finally, I added a arrow to the wounded horse made from thin wire with Paper fletching. The groundwork is made with small pieces of slate embedded in Magic Sculpt. I have covered this approach in my earlier threads for those interested. Martin64, DaddyO, Grod and 18 others like this. Absolutely stunning detail and crispness for such a small scale! Very well done, including the presentation. I've been waiting to see your latest.Well worth the wait. Excellent painting on such a small scale. About as good as I can do on 75mm. Well done indeed. Thanks Adrien, Mark and Chris. 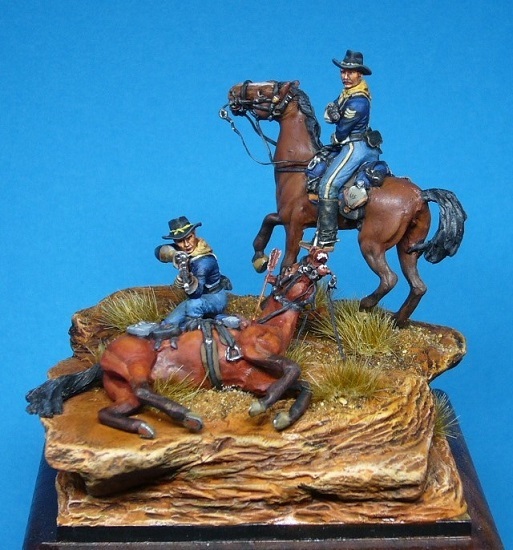 Well done painting and detail particularly since it is such a small scale. Excellent presentation as well. 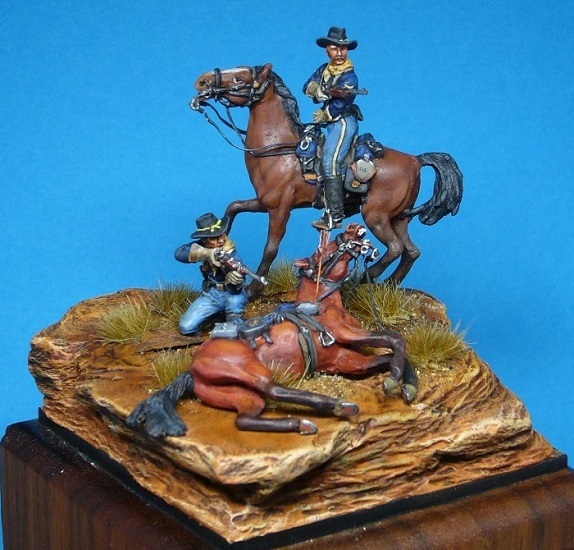 I look forward to your little diorama's and this one is exceptional. Superb painting. DaddyO and KenBoyle like this. A tiny vignette so nicely painted !! Simply fantastic work on these mini figures Ken . Ken, Outstanding work Ken. Man, you do a really great job on this small scale. I am familiar with the scale and it is not easy to paint. 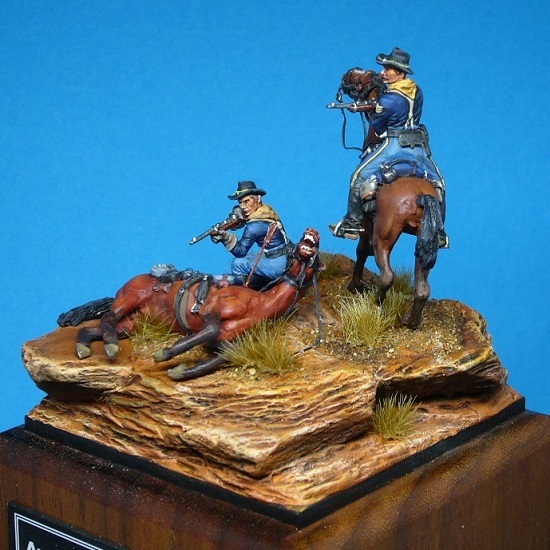 Like the attention to detail in your work and the color contrast in painting as well. The groundwork is awesome. Question, what is paper fetching? I like the way you made the arrow and am curious to hear more on it. The slate you used for the rock formations is a very nice modelling technique. As always, enjoy your work and imagination. Thanks for sharing! Thanks Guys! I love the smaller scale although it can be a challenge at times. Sorry for the confusion. The fletching (feathers) on the arrow was made of paper. I cut a tiny triangle of paper and white glued it to the end of a very thin piece of wire. That made two of the feathers. I then cut a smaller triangle for the third feather and glued it on. Keeping it to scale was the biggest challenge. Once dry, I then squeezed the fletching between my fingers to rough it up and make it less stiff. It was then painted and added to the vignette. You only see one arrow on the vignette, because it is a pain to make.